Not really. A healthy alternative for families who want to bring kids to a fun and a safe environment? Yes! This is how our church views our Fall Fun Fest. We ask people to come dressed up in their favorite costumes and we provide them with fun activities for the evening. We let the light of Christ shine all over our building that night! This year we built a maze with cardboard boxes, black light and a lot of creativity. Young people did most of the work to put this together. We also had face painting, giant inflatable games, which we locate inside our Family Life Center, and arts and crafts for all ages. 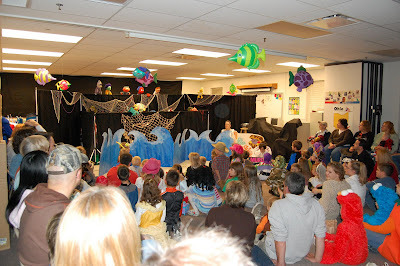 The highlights of the evening are the puppet team and a guest group we invite to perform. In previous years we’ve had magicians, painters, a man who did his juggling act using a chain saw, and other unique attractions. This year our puppet team presented the story of Jonah and “Quiet Love,” a group that performs songs with sign language and black light, were a crowd favorite. They both presented the gospel in all of their shows. Fall Fun Fest is also for adults. We go out of our way to make sure that children have loads of fun but still feel safe in our building. We realize that perhaps the best way to get to the hearts of the adults is to make sure that we treat their young ones with utmost love and care. We can tell the parents are happy when they leave our building and shake hands with members of our staff. Many of those folks had never been to our building before. Now we hope they will come back for some more. Did I tell you that each child gets a bag of candies as well? Oh yes, “no tricks, only treats.” The bags also have a tract that is appropriate for this time of the year. Fall Fun Fest is just another way that Wooster Grace finds to extend the love of Christ to people in our community in a tangible way.